Google shook up the mobile business landscape by announcing its acquisition of mobile office powerhouse Quickoffice. That move might not seem terribly large, but it creates a very different and unexpected dynamic in the business mobility world. It also sets up a showdown over business capabilities that could have lasting ramifications. Why is this move significant? It means that every company that produces a major mobile platform now also owns a serious office and productivity solution. Microsoft has Office, Apple has iWork, RIM has Documents To Go (which it acquired nearly two years ago), and Google now has Quickoffice as well as Google Docs. Each company can now ensure that its mobile business customers will have at least one solid option for working with Office files on their smartphones or tablets. Microsoft has made no secret that it believes Office will be such a major feature for business customers that they’ll buy a Windows RT tablet rather than iPad just for Office. In moving to Windows RT, which will run on ARM-powered tablets, Microsoft chose to sacrifice some of the core business advantages of Windows like integration with Active Directory, device management using Windows Group Policies, and the ability to run legacy Windows apps. The only major advantages Microsoft has now are licensing terms that make desktop virtualization cheaper for Windows RT users than for iPad or Android owners and Office. Windows RT has been pegged as the last best hope for a tablet and platform capable of taking on the iPad in business and making a serious dent in Apple’s marketshare. Even if Windows RT can’t steal significant market share from the iPad, it can attract users from the remaining two tablet platforms: Android and RIM’s PlayBook. Microsoft could have more success against either platform than against the iPad. Having Office as a killer app would probably help sway some businesses and individuals away from one of the major Android tablets like Samsung’s Galaxy Tab or RIM’s PlayBook. A Microsoft tablet, even if it can’t be managed like Windows PCs will still appeal to IT folks over Android options because of fragmentation of the Android OS and the related security and device management issues. Google’s purchase of Quickoffice ensures that the search giant can create a compelling Office alternative for Android. Quickoffice already has a version of its suite for Android tablets. Like its iPad counterpart, Quickoffice for Android has an extensive feature set that includes integration with the major cloud services, including Google Docs. The one feature it doesn’t have is track changes integration (Office2 was the first mobile suite to offer track changes support, which it announced today). Ensuring the continued development of Quickoffice is a big advantage for Google, particularly as the company integrates it more closely with Google Docs, Google Drive and other Google services. If the company can add track changes, then Android has a compelling business use case that might stand up against a Windows RT onslaught. RIM’s purchase of Documents To Go offered the company a similar advantage, one that would’ve been more effective if RIM hadn’t bungled the PlayBook’s initial launch as badly as it did. The confused messaging that painted the PlayBook as an entertainment device and not a business tool really hurt RIM as much, if not more, than shipping what amounted to a beta OS on the PlayBook last year. That brings us to Apple. While Apple obviously has iWork as an Office-type solution, iWork is more consumer oriented, costs more if you want the entire suite, and doesn’t really offer any file management capabilities or integration with services beyond iCloud. That said, iWork on a Mac is pretty good as an alternative to Office and it supports some key business features including track changes. If Apple brings those to iWork for iOS, it could develop some level of business credibility. 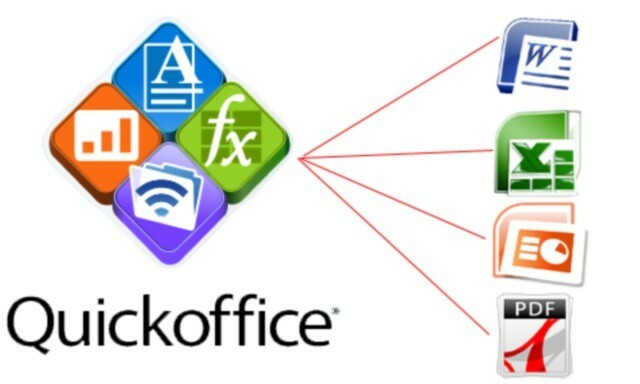 Of course, Quickoffice remains available to users of many different platforms including iOS. So does Documents 2 Go. It’s quite possible Microsoft will release an iOS (and possibly an Android) version of Office. Then there are other options like Office2 that aren’t owned by the big players. Perhaps Microsoft, Apple, Google, and RIM won’t kill off or refuse to develop options for platforms they don’t produce. However, each company is now prepared to battle over Office-like functionality and features if doing so is ever required.